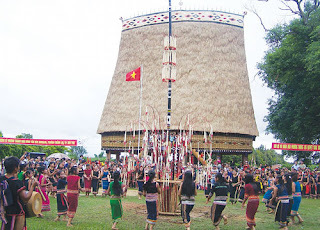 Ethnic villages - There are many kinds of Ethnic group in Kon Tum Province. They were all happily living in the forest and were changing their life due to the light of civilization. Konkotu Village is the representative of Bahnar group in Kon Tum. It located around 11km from the City, crossed over a suspension bridge to another side of Dakbla River to the East. Konkotu is right on the bank of that river. As other Ethnic tribe, Bahnar group attached their life to mountain and forests. Bahnar people like dancing and playing a great number of traditional instruments. Konkotu is well-known as a place for tourist to visit. There is a “Nha Rong”, a communal house where tourist can enjoying the traditional music show and join in the villagers for dancing. Visit Sedang villages as Dakrijol, Dakripeng on the way up to the Northwest in Gak Glei or to Kon Ray for many other villages.